Normal MDE files created by Access contain extra information that we like to call "compiler junk" - this is redundant information about variable names, data types, constants, UDTs etc that are no longer needed in a fully compiled MDE file. However, this "compiler junk" makes it much easier to decompile/reverse-engineer the VBA code in an MDE file to a standard that is very close to the original VBA source code (including for example all variable names). In fact, for those that can prove ownership of their MDE files, we at EverythingAccess.com offer a service for reverse-engineering them including all VBA code. You must be able to prove lawful ownership beyond any doubt for our service - but that is not to say that another company (or utility) won't offer a non-validated conversion service in the future. But I thought that the VBA source code in MDE files had been stripped out? Yes, you're quite correct. However, the source code can be re-built with very high accuracy by using the combination of the compiled code and the "compiler junk" which is left behind by Access when creating the MDE file. Well, if you want to better protect your VBA code, then the solution is to remove the extra "compiler junk" from the MDE file completely which makes it much harder and much less desirable to decompile/reverse-engineer the source code. By removing the "compiler junk" does not prevent decompiling/reverse-engineering the VBA code, but it does make it that much harder and the result would be source code that does not look anything like the original source code (and therefore much less understandable). This article shows you how to make use of the utility MDE Source Code Protector by EverythingAccess.com to remove this "compiler junk" safely from an MDE file. Once installed, open the MDE Source Code Protector from the Start menu. The first thing you need to do is load your MDE file into the MDE Source Code Protector (you may type the full path to the .MDE file, or use the Folder icon to select it in the GUI). Note: A copy is taken of the MDE file in order to ensure you always have a backup available in case anything goes wrong. Next, click the button and the file will start to load. This may take a few moments. Note: This screen is meant as a guide only - it gives you an idea of what is being exposed in your MDE file without showing actual values of constants etc (as this would pose a security risk for many developers). STAGE 3: Generate a new MDE file, removing the 'compiler junk'. Now that you've viewed the vulnerabilities posed by the "compiler junk", you can now remove it. Note: Under normal circumstances you will have no need to change any of the options on this screen. As you can see, the "compiler junk" has now been removed, and your MDE file is now much better protected against decompilation / reverse-engineering. MDE to MDB Conversion Service Fully convert your Access MDE files to the original MDB format (also supports ADE -> ADP conversions). Requires lawful ownership to be proven. 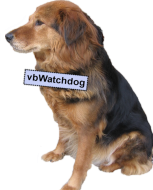 What did you think of 'Protect the VBA source code in your MDE files'?